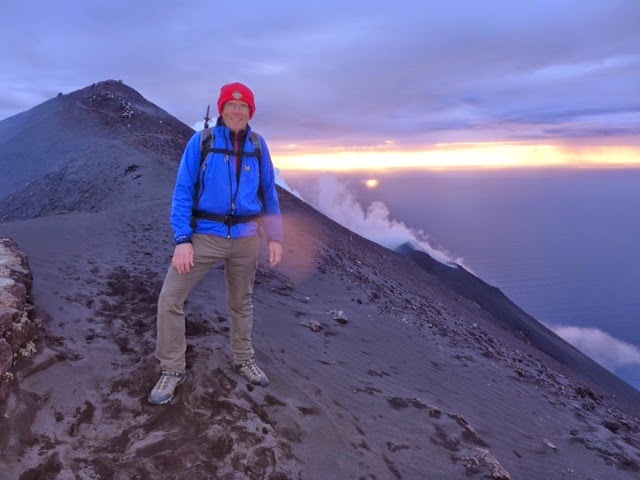 This blog brings news from mountaineering trips and other travels. 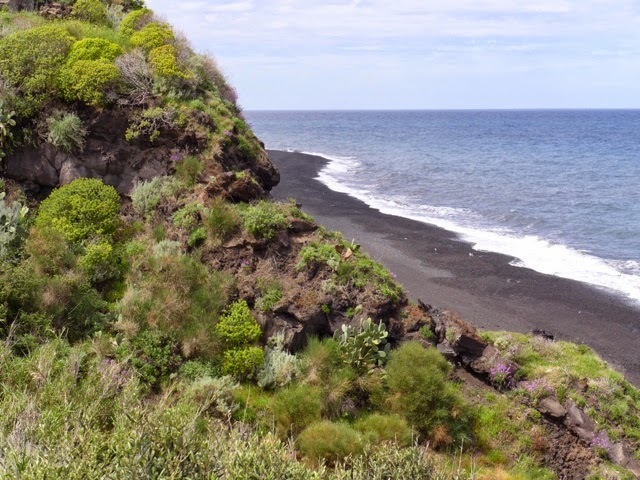 This time I'm wandering around on the islands of Lipari, Vulcano and Stromboli to the north of the island of Sicily, hopping between them all by hydrofoil, and doing some walks in the wild volcanic scenery of this appealing archipelago. Collectively they're known as the Isola Eolie, or the Liparian or Aolian Islands, named after the Greek god of wind, Aeolus. The journey begins in Catania, Sicily's second city, after a flight of some 2 hours 40 minutes from London Gatwick. 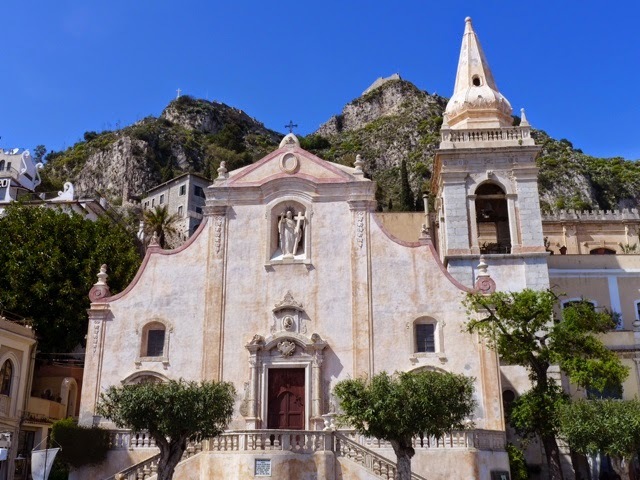 It's typically Italian in flavour, with wide boulevards and plentiful piazza, buildings of fading grandeur, and bustling streets full of stylishly dressed locals. And there's a big student presence here with a university in the town, so there's an energy about the place. 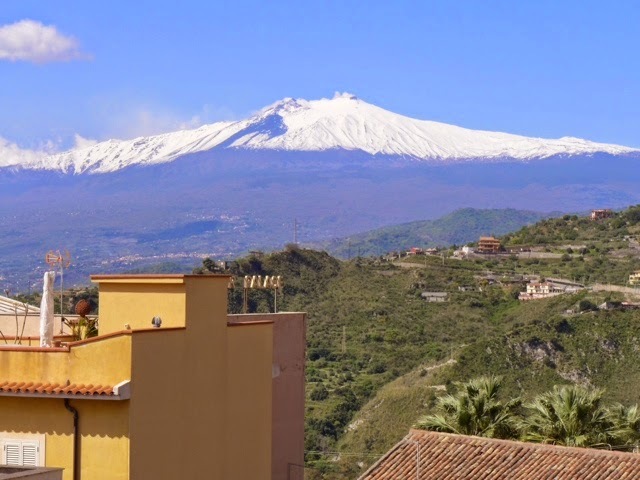 The city sits under the brooding 3,300m Etna volcano and there's a smoke plume emanating from the snow-capped summit as I write, which means summit access is likely to be closed whilst I'm here. 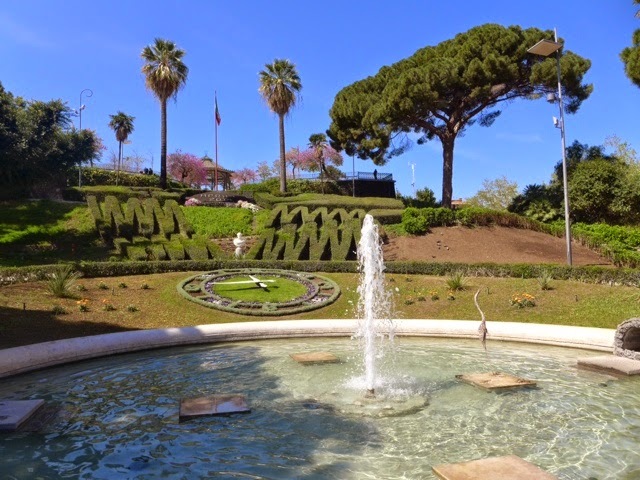 The temperature here in early April is a very pleasant 20C, and it was a pleasure walking around Catania's centre, starting in the attractive Villa Bellini gardens. 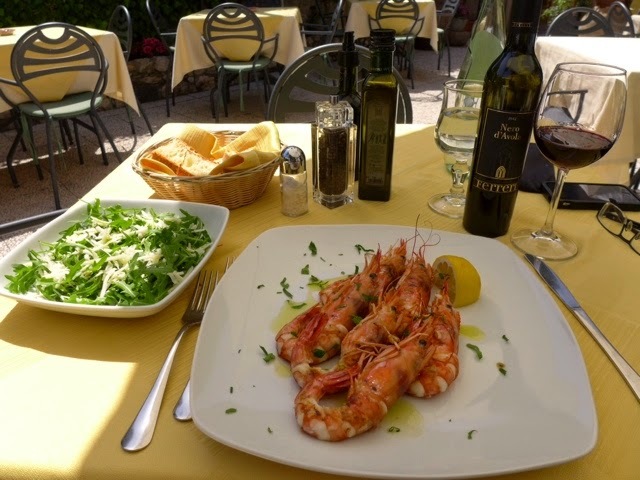 Near the Duomo there's a busy fish market and hidden within it there's a restaurant called Fratelli Vitorio, the decor rather basic, but some excellent fish antipasti and a main of grilled fish was enjoyed. A nice way to kick off the trip. 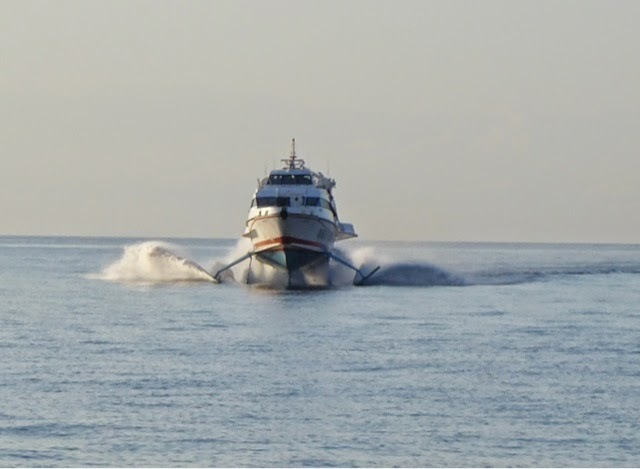 Leaving Catania, my transfer took me to the northern port of Milazzo for the hydrofoil journey to the largest of the Aolian Islands, Lipari. 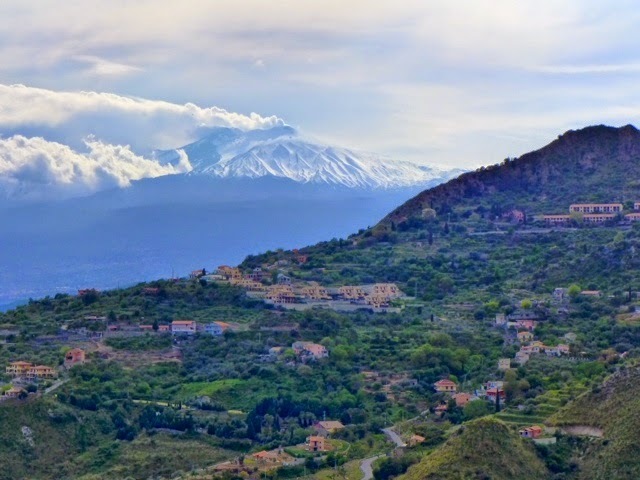 The road to Milazzo was interesting, passing the eastern flanks of Mount Etna, smoke billowing from a new eruption, the slopes extensively cloaked in snow. 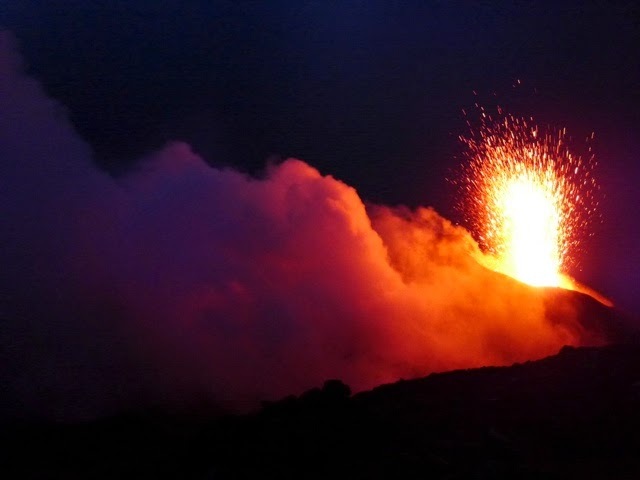 Catania has been wiped out by many lava flows over the centuries, the northern end of town comprised almost entirely of new builds. 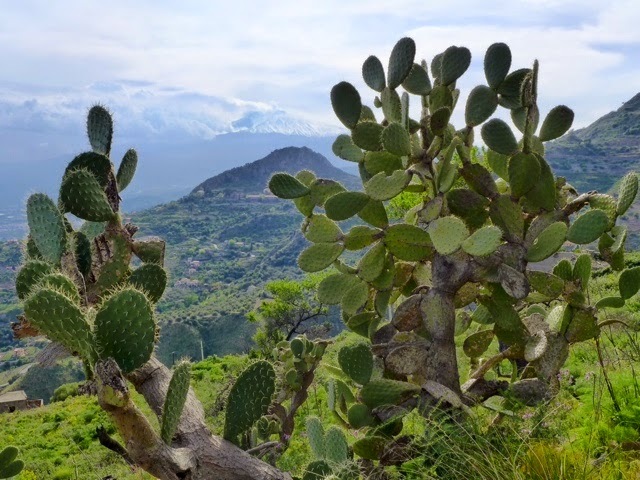 Passing orange and lemon trees, olive groves and stands of prickly pear, we were soon approaching the hill towns around Taormina, pine trees now more prevalent, alongside eucalyptus, cherry and almond trees. 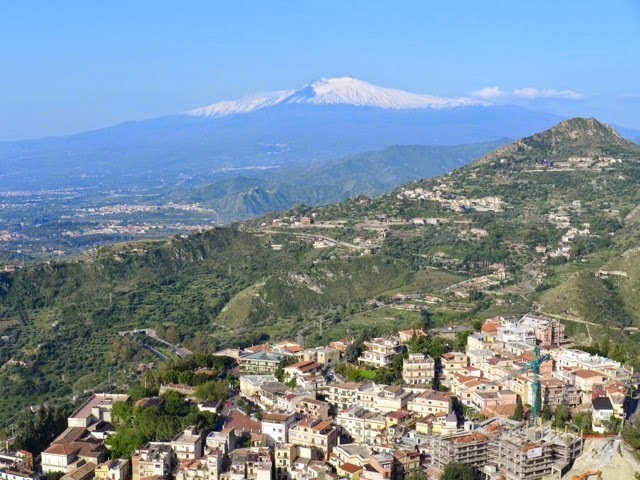 Attractive mountainous but densely populated landscapes (apparently there are 6 million people living in Sicily, one tenth of the Italian total). Passing the port of Messina, mainland Italy, Calabria, comes into view, just 3km away at the nearest point, and tempting a future road trip. 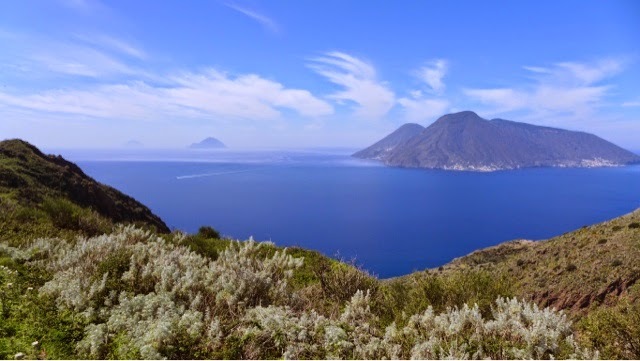 The crossing to Lipari took one hour 10 minutes, via the island of Vulcano, on a flat calm sea. 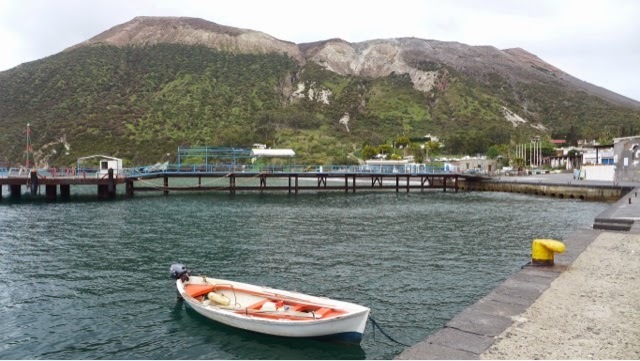 The first walk of my trip started with a local bus ride across Lipari to reach Quattropani on the west coast. 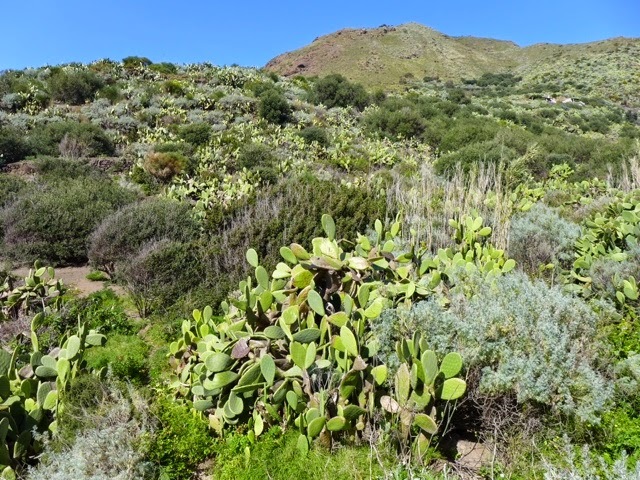 With fine views to the nearby volcanic island of Salina and the more distant Filicudi and Alicudi, there was a 500m descent through old kaolin workings to reach a fine coastal path which took me through stands of bamboo, white flowering thistle, prickly pear and gorse to reach more solid tracks into the village of Pianoconte. Ascending the concrete tracks it was notable that black obsidian was frequently embedded in the surface, a clear sign of the volcanic heritage of Lipari. As the afternoon drew on I was conscious of a strengthening wind, yet why was I was getting even hotter? Ah, it's the scirocco, the hot wind straight from the Sahara, which periodically affects the Meditteranean countries. 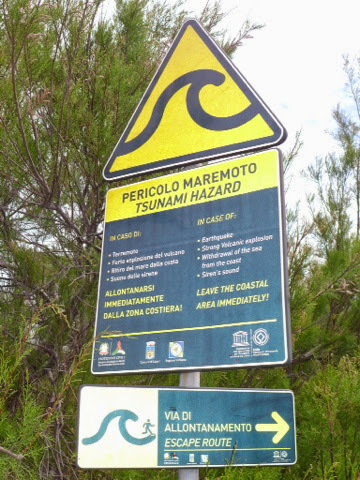 And, dropping down to Lipari, the sea was certainly getting more lively, a sign of more turbulent conditions that then prevailed overnight. My little reward for the effort of the day? 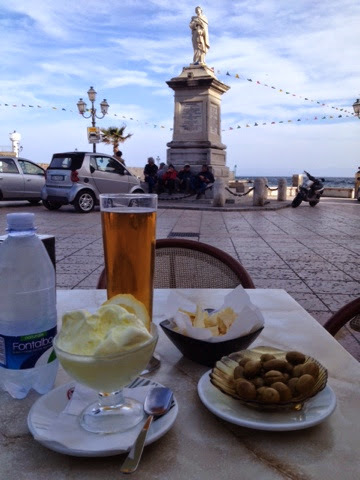 An excellent lemon ice cream enjoyed in the cosy Marina Corta, near my little hotel, the attentive Rocce Azzurro, right next to the sea. Self indulgence in Marina Corta! As many times before, I'm travelling with Headwater, the holiday company who always seem to choose characterful, often family run, hotels as a base for some great walking and cycling routes. 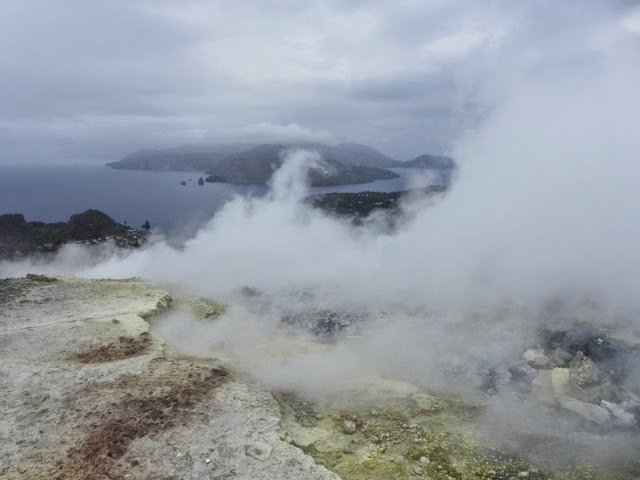 The following day, cloudy with a cool breeze, took me on a ten minute hydrofoil ride to the small island of Vulcano, completely dominated by the volcanic cone with fumeroles on the periphery venting sulphurous gases. 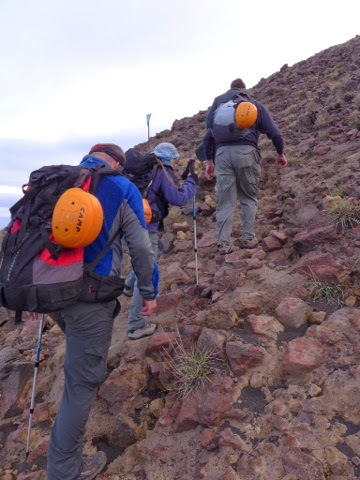 The ascent was straightforward, on a wide track of coarse ash, then compacted volcanic soil, then rockier towards the crater rim. A climb of about 350m, despatched in 50 minutes, although the intended clockwise circuit was compromised by excessive fumerole emissions, which yours truly wisely avoided by going anticlockwise to the summit at 394m. Good views into the crater, and hazy views back to Lipari and neighbouring islands. An easy excursion, barely deserving a beer, but I rewarded myself anyway. After a rest day in Lipari, finishing the excellent book The Leopard by Giuseppe Tomasi di Lampedusa, a story of the demise of Sicilian nobility following the Italian unification movement which started in the mid 18th century, it was time to hop on another hydrofoil, this time to the northernmost of the Aolian Islands, Stromboli. Somewhat alarmingly, the boat first headed south, so I assumed I had boarded the wrong one, but after picking up passengers in Vulcano, it then headed for the island of Salina, passing Lipari once again and affording views to the village of Cannetto, formerly a centre for the extraction and export of high quality pumice, used commercially as a polisher. 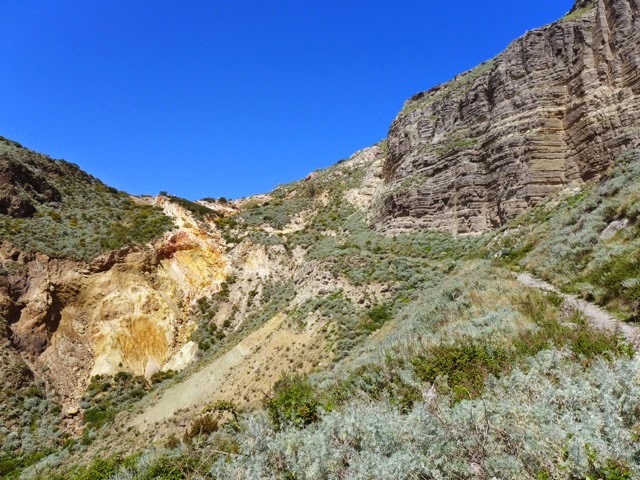 Salina boasts two extinct craters, and is good for the cultivation of vines and capers. 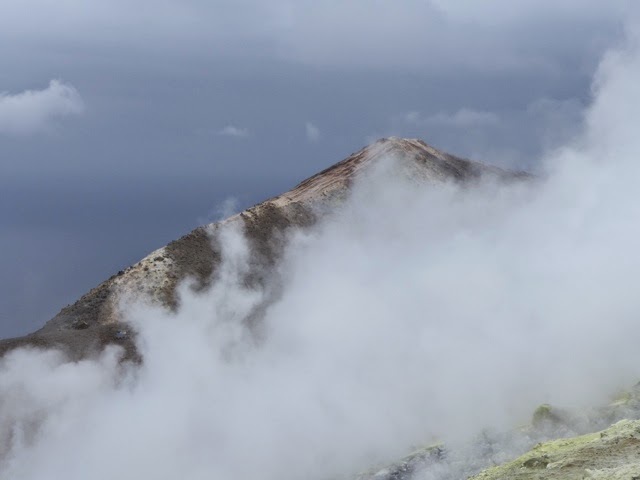 Next, we stopped on the smaller island of Panarea, which has a Bronze Age (13-14th century BCE) village on the southern tip, and some active fumaroles. 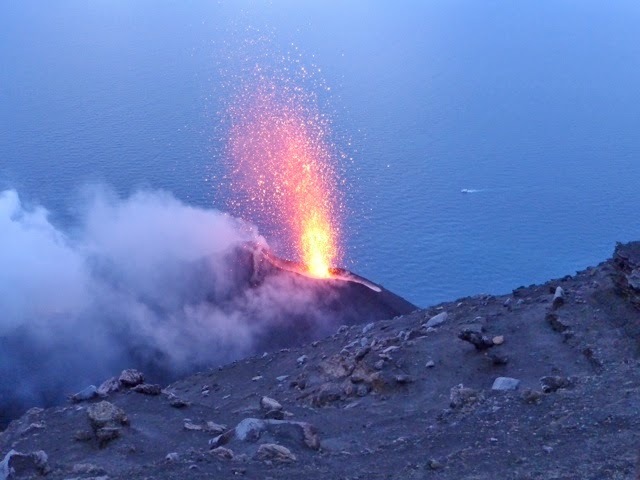 About 90 minutes after setting off we reached Stromboli, it's famous volcanic peak rearing sharply upwards and one of Europe's few active volcanoes. 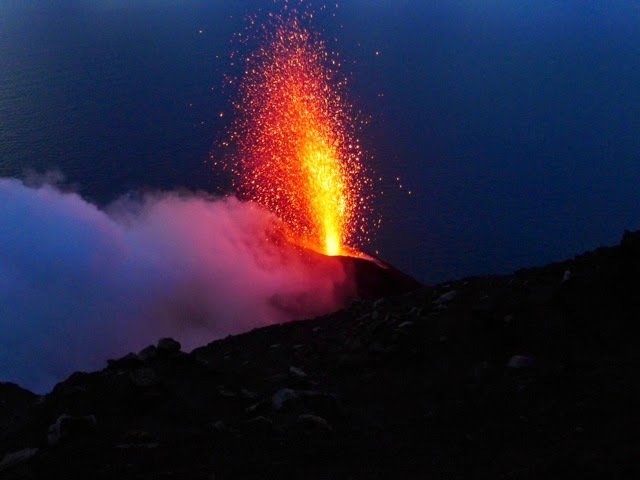 The name Stromboli is derived from the Greek "strombos", meaning 'conical'. 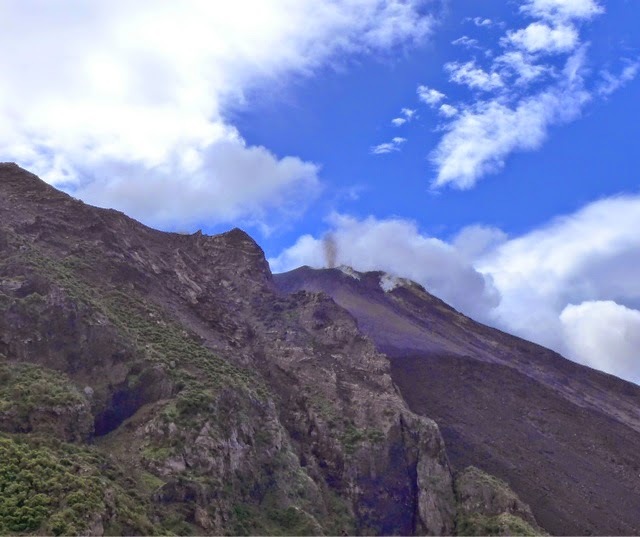 The summit, at 924m, is an extinct cone, and today there are three active craters on the northern slopes. 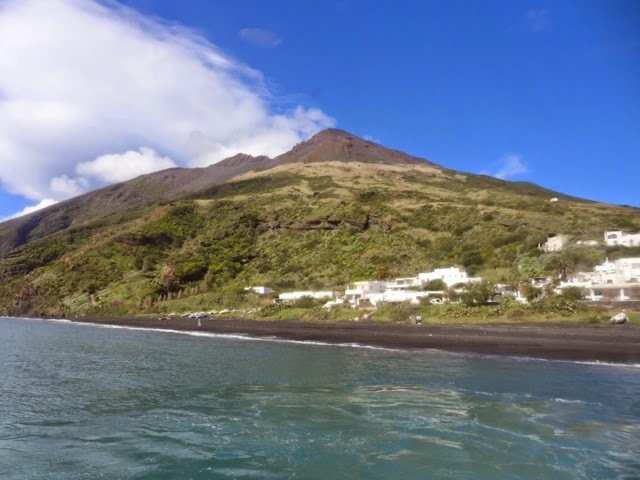 The last major eruption was in 1930, and today the mountain is closely monitored and the town streets are festooned with signs pointing out tsunami escape routes and assembly points. 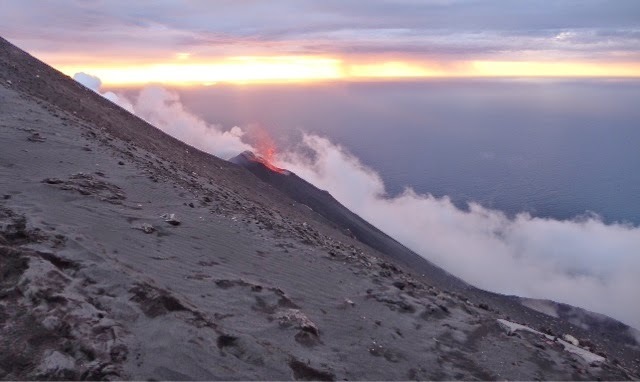 I walked one of the popular volcano circuits to view the regular eruptions of the lowest of the active vents (it erupts, quite explosively and noisily, about every 20 minutes). 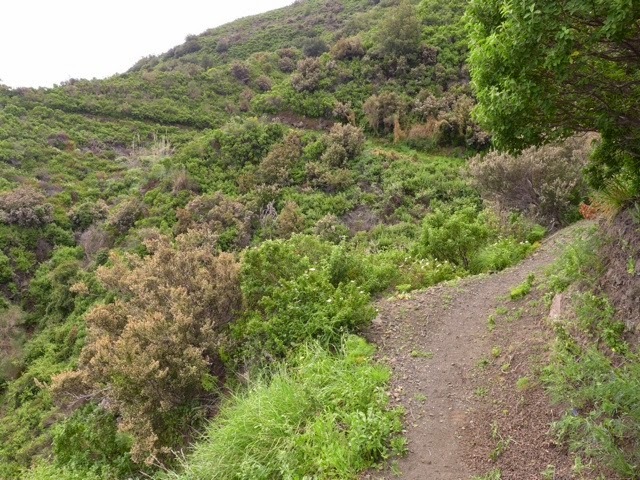 This is the Sciara del Fuoco, the 'road of fire', which climbs through dense vegetation on a good path to a helipad at 425m, beyond which access is only permitted with a guide. 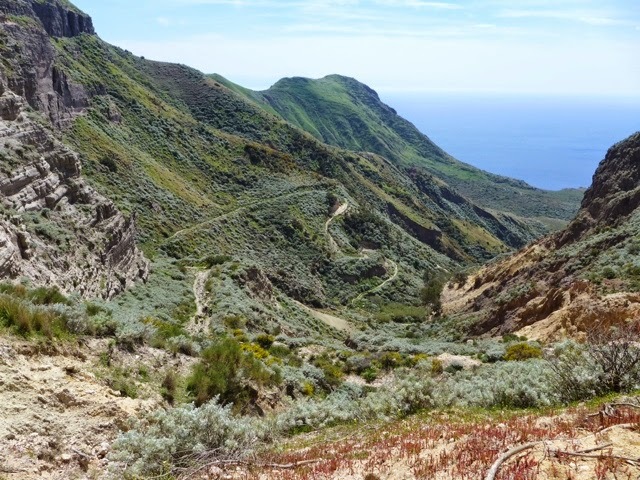 It's quite a spectacle and worth the effort, with an easy descent route back to the village of Stromboli via a paved mule track originally built for the filming of the '50s film 'Stromboli, Terra di Dio', starring Ingrid Bergmann. 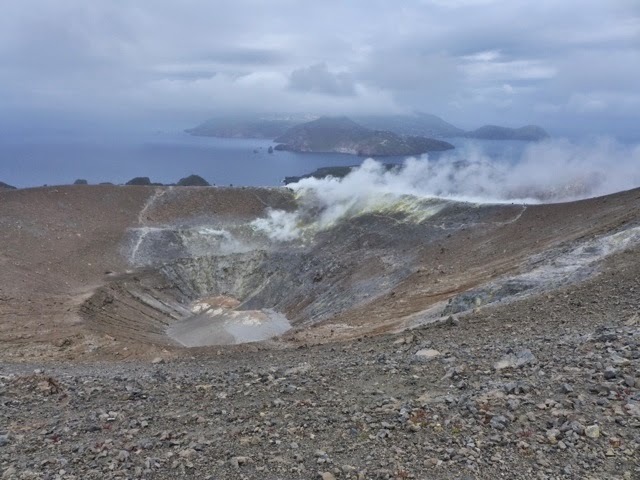 But the highlight of my stay was the evening walk to the secondary summit, at 900m, to look down into the three active craters and enjoy the spectacle of one of the best natural firework displays in the world. And it didn't disappoint. 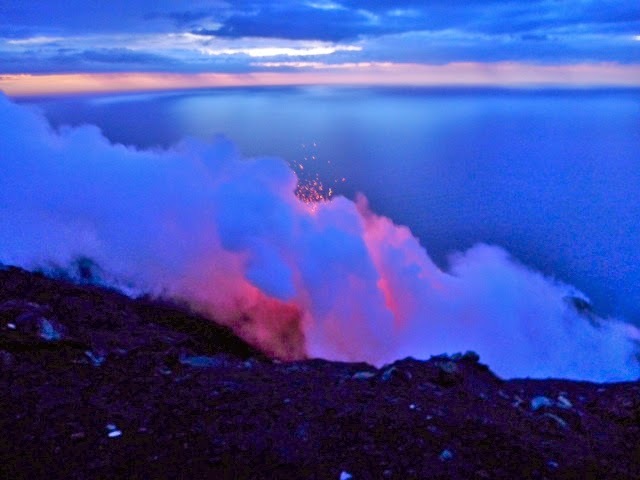 The lower crater was most active, the other two mainly emitting great clouds of steam and gas. 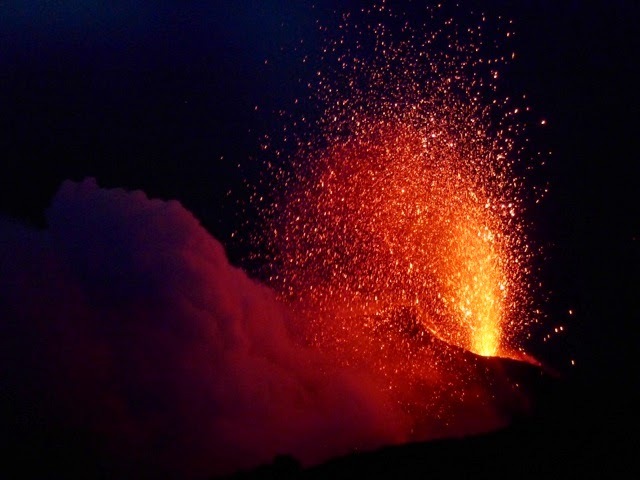 But as soon as darkness fell, you could see the tremendous lava explosions happening almost continuously in both of them. The climb takes about two hours, and our guided group had about an hour on the summit, albeit very cold due to a strong wind. 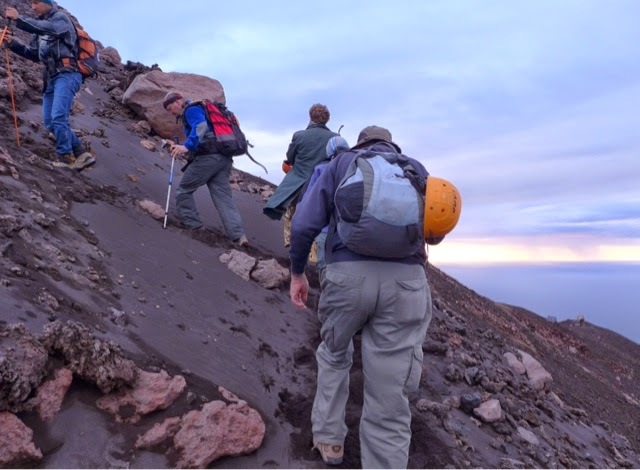 The ascent is relatively easy, although involves a sustained climb, crossing black lava sand and following a path up through some rockier sections. The summit ridge was gained just as the sun was setting. Awesome. 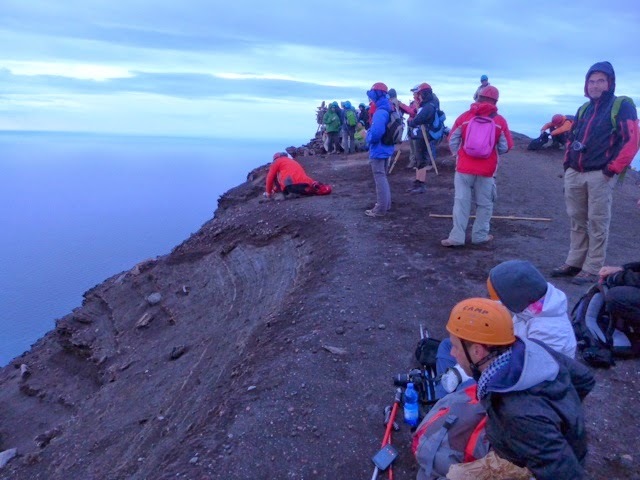 The return journey takes a different route, leaving the summit directly southwards, and almost immediately you are walking on deep black sand, acting like a brake on your descent and making the relatively steep ground easy to descend. It's always surreal being on a mountain at night, and this evening was no exception. On the descent, our group quietly concentrated on foot placement assisted by head torches, leaving the black bulk of Stromboli behind us, a clear sky above revealing its constellations, boats moored far below us sporting their tell tale starboard and port lights, and the lights of Calabria and Sicily twinkling in the far distance. We dropped about 450m in less than an hour, eventually getting back to the village by about 2200. Just in time for a celebratory beer and pizza. 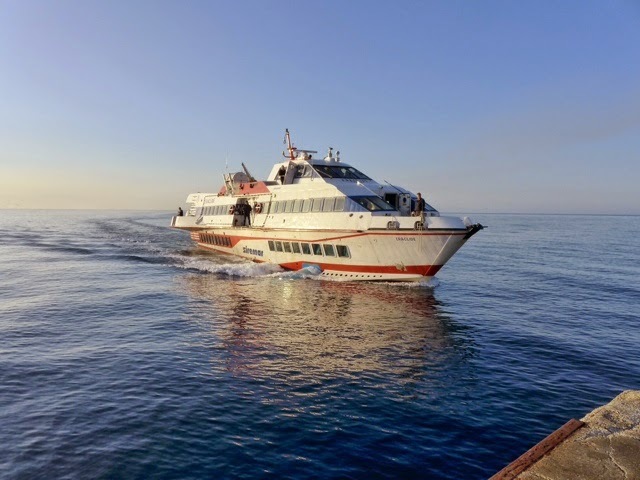 It was an early start the following morning, the day showing all the signs of being warm and sunny, and the 0715 Siremar hydrofoil whisked me back to Milazzo, the Sicilian port just north of Messina, en route to my next destination, the historic town of Taormina. 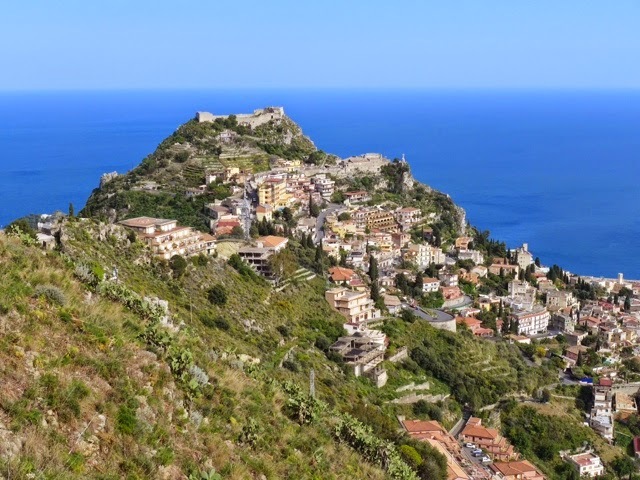 Taormina is a joy to visit. 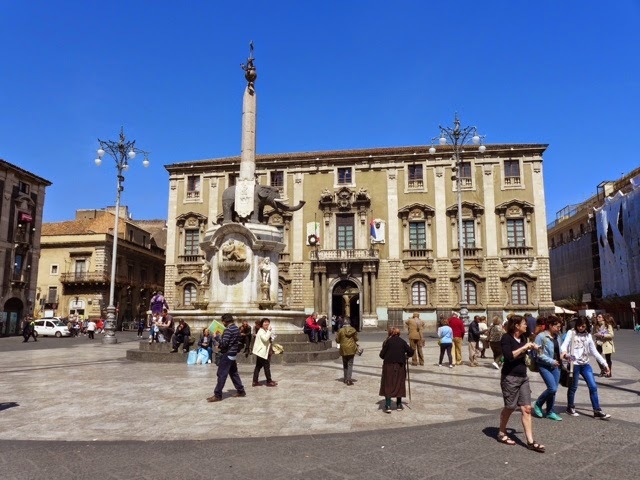 My accommodation, the Hotel del Corso, adjacent to the western gateway to the town, the Porta Catania, is actually located on the principal street, Corso Umberto I, which, even in early season was thronged with visitors (mainly Brits and Germans) as I arrived. 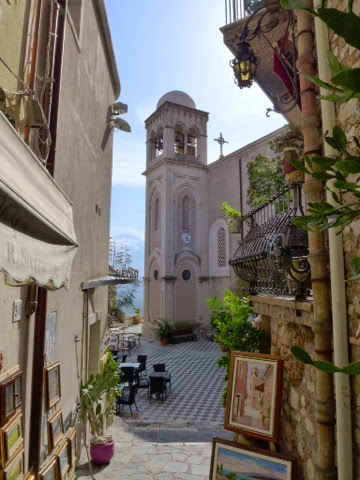 With the sun shining, an early lunch preceded a walk through this attractive town, established in the 3rd century BCE, and variously settled by the Greeks, Romans, Arabs and Normans. 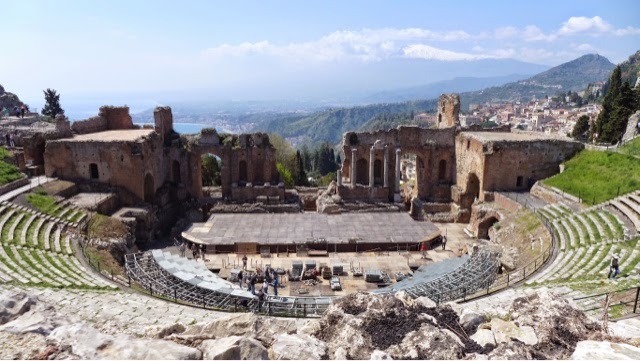 The Roman period dominates the town's architecture and infrastructure, although there are the remains of a large Greek theatre (albeit heavily remodelled by the Romans in the first century CE), just to the east of the town centre. 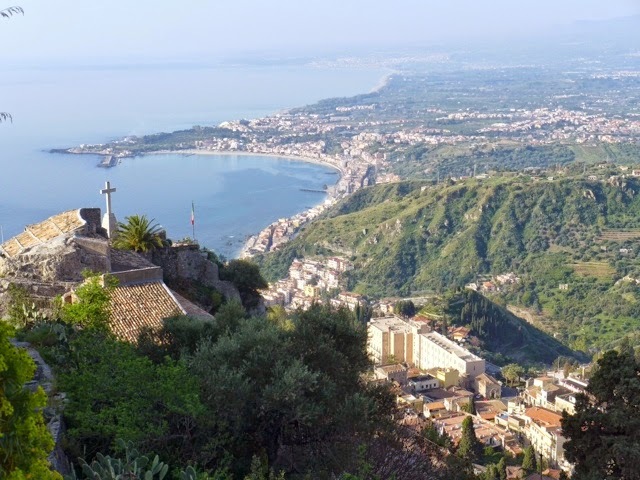 My walk took me steeply up to Castelmola, a village which functioned as a protective fortress over Taormina, and affords excellent views over the coast north and south of the town, and down to a ruined Saracen castle and nearby Santurio Madonna Rocca. 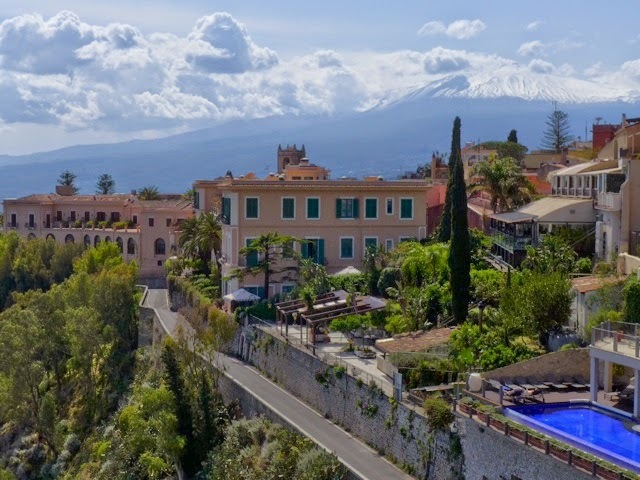 A superb panoramic path from Castelmola's duomo brought me swiftly back into town, with great views to the coast and to Etna. A good day! The final day on Sicily. 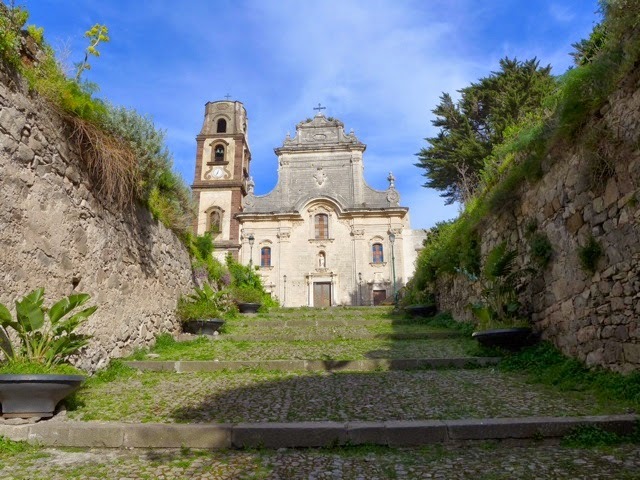 An early morning walk, a climb of about 200m to the Santuario Madonna Rocca and the castle just above it. Already warm by 0800, this was certainly the time to get up the steps to this fine viewpoint. Later I walked through the town and down 300 steps to the beach near Isola Bella, followed by a quick look at the sizeable Teatro Antico, a splendid Greek/Roman amphitheatre accessed via the touristy Piazza Vittorio Emanuele. A lazy afternoon and outstanding dinner at Trattoria Da Nino (Via Luigi Pirandello, just down the road from the top cable car station, on the right) prepared me nicely for the homeward journey the following morning, courtesy of EasyJet. Well, you know you're on Italian soil when the young guys leave their girlfriends waiting whilst they look in men's clothes shop windows, or is it that they're checking their own reflection?! Sicily, still a proud island race, and the macho culture prevails. On the Islands fishermen wiled away the hours in bars playing cards and drinking grappa; in the towns they strut, talking volubly, and one thinks of Mafiosi on every corner, not that's the case nowadays...there's not enough money to be made here away from the mainland. 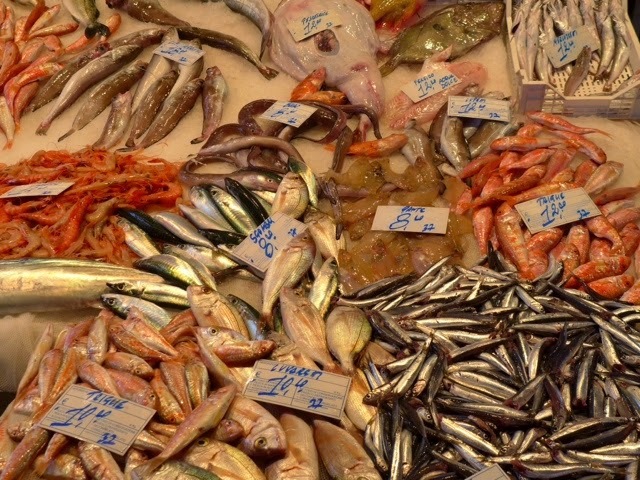 But the food is great, if expensive in the tourist honeypots, fresh fish and local vegetables abound...I've even learnt to like capers. And the scenery and townscapes are magnificent. Early season the climate is a bit fickle, but when the sun shines it's mellowed by cool breezes, and the tourist spots aren't too manic. 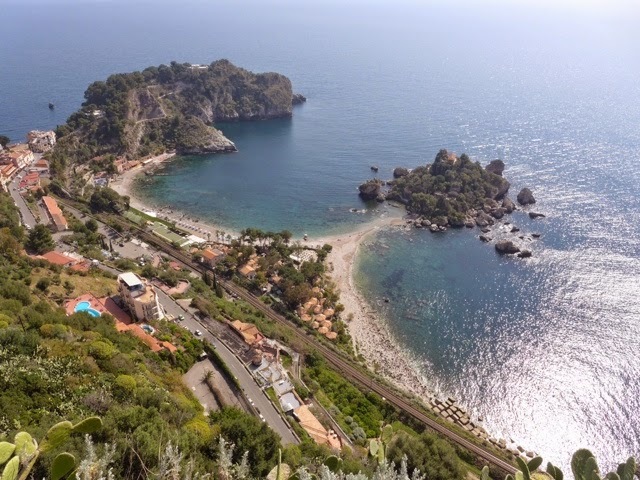 But I'd avoid high season in places like Stromboli and Taormina: very popular with Italians, Brits and Germans, these beautiful spots would have far too many people swooning over the sights for my personal taste. However, I'll be back! 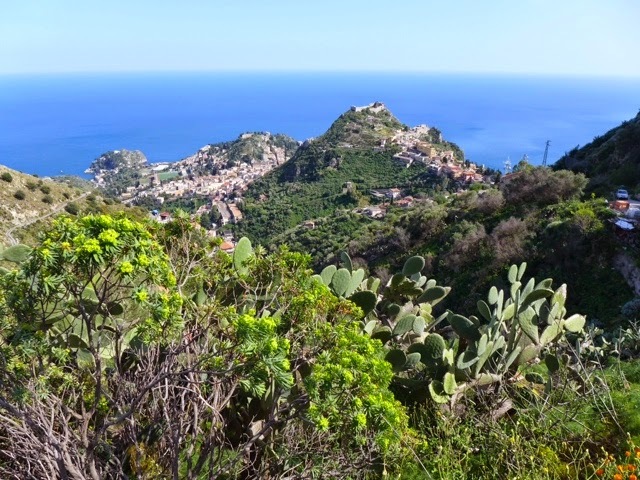 Many more walks to do on both Sicily and the Aolian Islands, and the local wine isn't bad either. I'm heading off on almost the same trip as yours in September, thank you for sharing such a lovely write-up, I'm looking forward o it even more now!